Andrew: Hello readers! In last week’s preview we chatted about a film that was just expanded to wide release last Friday, The Best Exotic Marigold Hotel, starring some famous British actors like Judi Dench (Casino Royale) and Billy Nighy (Love, Actually). I did not end up seeing it, but Sarah did and so I interviewed her for her review of it. So Sarah, the first thing I want to ask is what your favorite aspect of it was? Sarah: Oh just the feel of i!. The actual colors, the light… I mean that’s kind of what the movie was based around; this finding joy at a time in your life when society tells you that it’s over. It was just really nice. A: Why is it that the characters even go to India in the first place? S: Well none of the characters are connected at the beginning of the movie, but have all suffered a bump in the road in some way. 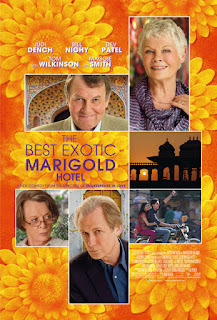 Judi Dench’s husband had just passed away, Bill Nighy and his wife are experiencing financial difficulties, and they all come to a point in their lives where things just aren’t going their way. 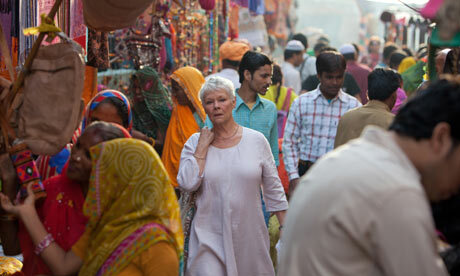 So they decide to take a leap of faith and try this Exotic Marigold hotel in India for elderly people to find new life, and to realize that it’s NOT over yet. And it’s a great, great cast portraying these journeys. A: Speaking of which, how did the cast do, and of the actors, did any stand out above the others? S: Well Dench’s character would be considered the main character. She kind of narrates the whole things, as she’s taking this trip she’s blogging so there are times where it kind of narrates how life is going. It was a powerhouse performance by all these actors who are probably at this stage in life where they’re not getting all the phone calls anymore, you know? And so I can imagine this is the type of movie they saw as an opportunity to kind of get their names back out there. Think about Maggie Smith (Harry Potter and the Sorcerer's Stone), Judi Dench, Bill Nighy and Tom Wilkinson (Batman Begins). They are from an era where British actors were really something!. And so they work really well together. A: Are there any particular parts of the film that rubbed you the wrong way, or were just general negatives? S: I will say the movie was a little slow at times. It’s very much a geriatric grade movie, it was slow and kind of meander a little bit, but it had a lot of heart. The whole movie had heart, so it was a fun movie. A: What was Dev Patel’s (Slumdog Millionaire) role in the film? S: He’s the manager and co-owner of the hotel. It was his father’s and now it’s his and his brothers’, but Patel had the same dream as his father to turn this into a thriving hotel. But he just didn’t have the business savvy. So his story is part of it as well, sort of his self-discovery through these people who are staying at his hotel, they all gain insight through each other whether it’s through their own personal story or experiences that they have on this trip. He kinda has a goofball persona, so it’s not like his character was very serious, sort of the quirky Indian guy, but he did well! A: Any other negative points besides it meandering a bit at times? S: I would say the slowness was a pretty big point for me. It was NOT an action film. It’s not a rom-com. A: Oh, so you said earlier none of the characters were related to one another before going to India, so there’s no romantic sparks or anything? S: Oh there are, there definitely are sparks. But it all happens in India. None of them are connected beforehand. They all learn something from each other, and it’s just interesting to see the evolution of their characters, especially Maggie Smith. I would say Smith’s character is the most evolved over the course of the movie. A: Are you glad your saw it? S: I am. It had a lot of heart. It was well made, they did a great job, the cinematography was beautiful. I’m not sure that I would ever need to see it in theatres. It was definitely an older crowd. But I would say this is a movie you could Netlifx one day, a rainy afternoon, kinda curl up with a hot cup of tea.